We talked about green mandarin oil in a former post, which is oil from the unripe mandarin orange. This time, we’re talking about clementine oil, which comes from clementine—a specific variety of mandarin orange. Clementines have benefits for the skin that are similar to mandarines, but they are unique in some ways. One of the most enjoyable is the scent—according to research, nearly 50 different compounds in the oil create the unique smell, which is known in aromatherapy for lifting your spirits. and has a unique and uplifting scent. Scientifically called Citrus Clementina, the clementine is the smallest of the mandarin oranges. It’s also the easiest to peel, since the fruit is naturally more withdrawn from the peel. The clementine also has no seeds—if you find seeds, the tree was cross pollinated with another variety. These personality traits—size, easy-to-peel, and no seeds—together make this fruit the perfect snack for kids. The name is said to have come from Father Clément Rodier, an Algerian monk. Legend says he discovered the unique orange in his mandarin garden. Others think the fruit originated before that in Asia. Regardless, it gained popularity in the U.S. in the early 1900s, and is now sometimes known as the “Christmas orange,” since it’s harvested from late fall through January. The tree itself grows to about six feet tall, is evergreen, and likes subtropical and tropical climates. 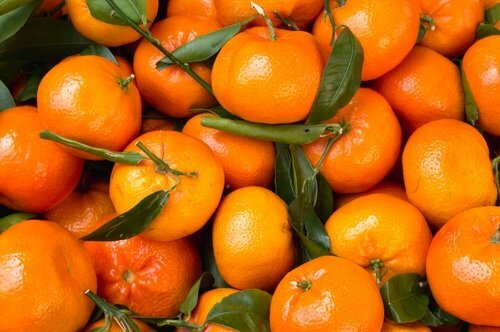 Clementines are a healthy, low-calorie snack, coming in at about only 35 calories each. They’re a great source of vitamin C—delivering about half the recommended daily intake, which helps support a healthy immune system. They also have potassium, vitamin B, and fiber, as well as some calcium, magnesium, and copper. Like all oranges, Clementines have flavonoids that offer antioxidant protection, helping reduce the risk of health problems. Clementines are perfect on their own, but you can also add them to salads, cereal, oatmeal, and yogurt. One of the biggest benefits of Clementines is that they’re loaded with citric acid, which helps eliminate cleanse dirt, oils and impurities associated with oily skin. So if you’re suffering from oily or combination skin that has clogged pores, this is a great ingredient for you. Vitamin C: In addition to supporting healthy cells on the inside, vitamin C applied topically helps to firm and tighten the appearance of your skin. It also provides antioxidant protection. Gentle: Like mandarin, Clementine oil is a very light, gentle oil that is perfect for sensitive skin, and is recommended even in products used for children. Antioxidant: Clementine oil contains flavonoids known as “anthocyanins” that help reduce the affects of environmental stressors. Toning: The oil has a toning effect on skin, helping to reduce the appearance of pores and balances skin oils. Unique scent: As we mentioned, Clementine provides a unique, uplifting scent that helps improve mood. Is there any surprise that we’ve added Clementine oil to our facial oil for oily skin? Try it and let us know what you think of the lovely scent! Do you enjoy Clementines at home? Please share your tips for how to use them! Giuseppe Ruberto, et al., “Essential Oil of Two Pigmented Citrus Hybrids, Citrus clementina & Citrus sinensis,” J Agric Food Chem 1997, 45(2):467-471, http://pubs.acs.org/doi/abs/10.1021/jf960109j. I used to be experiencing unrelieved cystic zits for a very long time until I found an incredible healthy option.